Sometimes we don't realise we have a problem until we're directly confronted with it. The problem becomes that much greater when the confrontation occurs in front of an audience. This was the position John Fahey found himself in when he walked out onto the stage of the Uni Mensa in Hamburg. He was wearing a corduroy jacket and carrying a guitar in each hand – but he didn't have any stands for his guitars and when he sat down and tried to take off his jacket, it was obvious he had a serious problem. Both Fahey and the audience chuckled at his predicament but his nervousness was palpable. Eventually someone from the TV crew came onto the stage and held his guitar while he removed his jacket. As he settled down, Fahey, in reference to John Martyn who had performed before him, remarked "Hey, that guy Martyn is really good. I'm afraid to play!" He smiled wryly as he said it but he wasn't (entirely) kidding. As soon as Fahey began to play, however, any sign of uncertainty disappeared instantly. It was an amazing transformation. Like all the greatest musicians John Fahey simply melded with his instrument when his fingers struck the strings.I first heard John Fahey's music when I was still at school in New Cross in South London in the mid-Sixties. John Peel played "The Death of the Clayton Peacock" on his radio programme and shortly afterwards I met someone at school who already owned several Fahey albums. He told me he'd bought them at a small record shop (run by a guy called Chris Wellard) not far from New Cross station. I went there after school, listened to all the Fahey albums in stock (in those days it was still possible!) and came away with a copy of "The Transfiguration of Blind Joe Death". In the months that followed I bought every Fahey album in Chris Wellard's shop and ordered the ones he didn't have directly from America. Several years ago I attended a lecture by Brian Eno during which he conducted a brief experiment with the audience. He'd brought along an old vinyl record player and he said he was going to drop the needle onto a few records and then remove it almost immediately. "But," he continued, "you will recognise the music instantly." Surprisingly, he was right. The records he used for his experiment were by the Beatles and the Beach Boys and the point he was making was that certain artists have the ability to create a sound (irrespective of any specific song) which we recognise almost instinctively. That sound is unique to the band in question, even though they used the same instruments available to everyone else to create it. This is true not just of the Beach Boys and the Beatles but also of John Fahey – a fact made all the more incredible when you consider that Fahey only ever used one instrument to create his unique sound: a six-string acoustic guitar. He only ever recorded one piece – "America" – on a 12-string guitar – and towards the end of his life he famously/infamously switched from acoustic to electric guitar. More about that later. Before his performance in Hamburg I interviewed Fahey and he essentially gave me the same answer to several of the questions I asked. He said the way he played all came down to the rhythm and that the rhythm was as much the result of what he didn't play as what he did play. In other words, it was equally about the space between the notes as the notes themselves. Picasso could create a masterpiece with just a few strokes of his brush – but in addition to his innate talent it took years of experience to know which strokes were the right ones. John Fahey, in my opinion, was as adept with his guitar as Picasso was with his brush. In an attempt to define his music someone (it may even have been Fahey himself) came up with the phrase 'American Primitive' and although any 'definition' of music (or art in general) is doomed to fall short, the phrase is somehow apt. Fahey was self-taught; he developed his own style by listening to old blues, country and bluegrass records – but what really set him apart from other acoustic guitarists was not just his unique feel for his instrument but his ability to compose highly evocative, seemingly timeless melodies. Fahey was never a 'technical' guitarist, even though he did make a couple of extremely low-budget, must-see, 'how to play the guitar' videos. In these videos Fahey is backed up against a bare wall in a room that resembles a prison cell and his attempts to 'explain' how he plays invariably come down to just two words: like this!I once asked Jackson Browne if he ever worried about revealing too much of himself in his songs; about becoming too personal and consequently not just hopelessly obscure but also hopelessly egoistic. "Absolutely not," he replied. "The trick is to become so personal that you tap into something that is actually universal, that everyone can relate to." John Fahey's music, even though it is purely instrumental, reaches those kind of depths time and again – and with the kind of 'inevitability' that characterises the very greatest music from Bach and Mozart to the Beatles and the Beach Boys. In his later years, Fahey renounced almost all of his early acoustic work. He decried its 'prettiness', its 'sentimentality'; he believed it wasn't a true reflection of his deepest feelings – feelings he had repressed for most of his life, preferring to 'hide behind' the 'beautiful artifacts' that graced his acoustic albums. In a book typically entitled "How Bluegrass Music Destroyed My Life" he revealed that he had been abused as a child and only when, in his final years, he began playing the electric guitar, did he feel that he was able to express the hurt he had for so long tried to conceal. 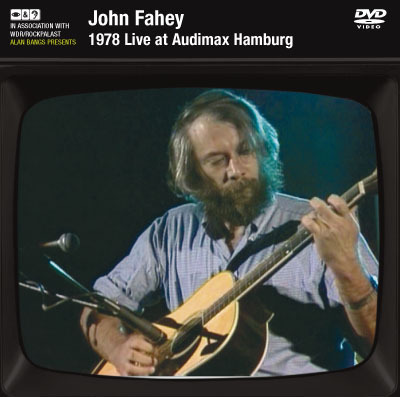 A couple of years before he died I saw John Fahey perform in a small club in Cologne. He was on a double bill with Jim O'Rourke and it was quickly obvious that the majority of the audience (no more than 60 people) had come to see O'Rourke and not Fahey. O'Rourke played first and when he left the stage about half the audience departed as well. It was close to midnight when Fahey finally began to play. He wasn't in good health, he was suffering from diabetes, he was overweight – and he was also playing electric guitar. About halfway through the concert a string broke and Fahey, who was wearing dark glasses, looked down at the neck of his guitar and somewhat pathetically said "Help!" The audience, thinking he was joking, laughed. But Fahey wasn't joking. Eventually someone had to wake up Jim O'Rourke (he had fallen asleep in the dressing room) and he came out to replace the broken string. This unexpected pause gave Fahey the chance to launch into one of his famously surreal monologues – a monlogue which ended with Fahey pointing at the low ceiling and asking the almost rhetorical question "which will come first: the new string or the black diamond express from Hell?" John Fahey died in February 2001 at Salem Hospital in Oregon after undergoing a sextuple bypass operation. He was 61. Since his death six tribute albums have been released—a testament, if any was needed, to his unique talent and enduring influence. In particular, Jack Rose and Glenn Jones continue to uphold the tradition of "American primitive" guitar. Note: Fahey was notorious for not using – or sticking to – a set list. He also liked to rework some of his compositions (live and on record) under different titles – and he would often run songs together to create long medleys. This explains (in part) why some of the songs are incorrectly titled. Trivia: About half way through the concert, and without saying a word, Fahey left the stage. The cameras continued to roll but nearly 10 minutes passed before he returned, sat down and, again without any explanation, continued playing. As we found out later, he had simply followed a call of nature.